(CBS/AP) LOS ANGELES - A coroner's investigator acknowledged Thursday that she made mistakes while collecting medications and other evidence from Michael Jackson's bedroom after he died, but she minimized the issues by saying no investigation is perfect. 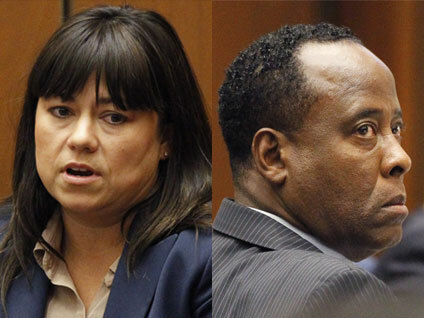 Investigator Elissa Fleak was aggressively cross-examined by defense attorney Ed Chernoff as he tried to expose flaws in the way medical evidence was handled by authorities in the case against Dr. Conrad Murray. Chernoff pointed to pictures that he said indicated things had been moved in the room. The images showed an IV pole and saline bag in two different locations. A bottle of medicine Fleak said she had found on the floor was photographed on a nightstand. In addition, Chernoff said Fleak didn't note that she had found a bottle of the powerful anesthetic propofol inside an IV bag until March 2011, nearly two years after the singer's death. "Would you agree with me that you made a substantial number of mistakes in your investigation?" Chernoff asked. Jurors at times leaned forward to look at the photos projected on a large screen. Some took notes on the testimony. Deputy District Attorney David Walgren attempted to minimize the missteps. "Ms. Fleak, did you conduct a perfect investigation in this case?" he asked. "Have you ever conducted a perfect investigation?" Walgren asked. "Are there always things you would have done differently in hindsight?' he asked. "Yes,'" Fleak replied, saying she had tried to be as accurate and truthful as possible. Fleak was assigned to the investigation on June 25, 2009, when Jackson died and she went to his rented mansion to collect evidence. Four days later, after Murray, the singer's personal physician, had talked to police, she returned to follow leads the doctor had provided which included a description of medications hidden in a closet. "Returning to the scene is not typical," she said, "and there was a lot more medical evidence." Chernoff questioned whether Fleak had heard testimony by bodyguard Alberto Alvarez, who said during a preliminary hearing in January that he saw the propofol bottle inside the IV bag. He repeated the detail for jurors last week and said Murray told him to put the IV bag into another bag before calling 911. Authorities say Jackson died of acute propofol intoxication combined with other sedatives administered by Murray. Defense attorneys have an alternate theory: The King of Pop gave himself the fatal dose when the cardiologist left the singer's bedroom. Fingerprint evidence stipulated to by both sides did not appear to bolster the defense theory. Jackson's fingerprints were not found on any medicine bottles. One of Murray's prints was found on a 100 milliliter vial of propofol which is a much larger dose than the doctor said he gave Jackson on the day he died. In testimony Wednesday, Fleak detailed numerous medications that were found in Jackson's bedroom and closet. By the end of the day, more than three dozen bottles of medicine were lined up in two jagged rows on the edge of the prosecution table, directly in front of jurors.